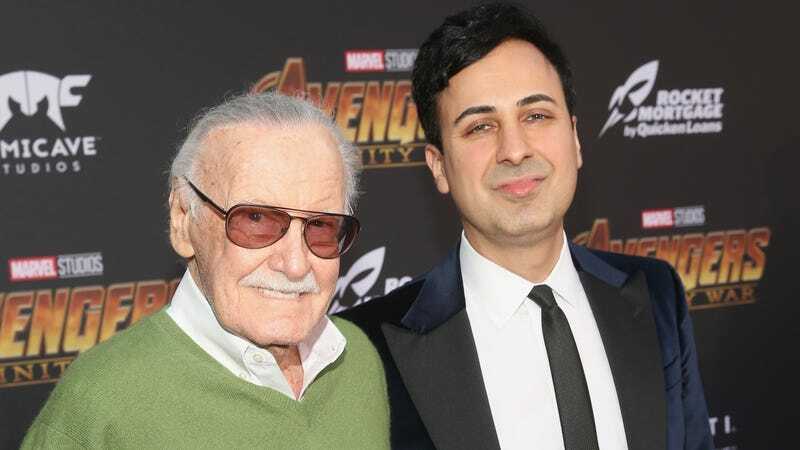 Stan Lee and Keya Morgan at the Avengers: infinity War premiere in Los Angeles. At the same time, however, Lee’s restraining order does gel with a report from earlier this year detailing Lee’s accusations that Morgan, along with others, was a person with “bad intentions” toward him and his daughter J.C. In a notarized document dated February 13, Lee claimed that Morgan, J.C.’s attorney Kirk Schenck, and Lee’s former manager Jerry Olivarez had “insinuated themselves into relationships with J.C. for an ulterior motive and purpose: to take advantage of Lee and gain control over [Lee’s] assets, property and money.” Olivarez, it should be noted, was connected to the company selling comic books signed with ink that was infused with blood stolen from Lee. As strange and upsetting as it is to see Lee becoming even more embroiled in this kind of ugly, messy, public drama, it appears as if he might finally be getting ready to sort this whole mess out—and finally put some distance between himself and anyone who’s trying to get their pound of flesh from him. Update 6/13: this article has been updated to reflect that Lee was temporarily granted his request for a restraining order today. A court date to decide whether the order will be permanent has been set for July 6. Update 6/14: Because Morgan was acting as Lee’s guardian prior to his request for a restraining order, according to a new NY Times report, a judge has appointed attorney Tom Lallas to be Lee’s “guardian ad litem,”—a person designated to make decisions in the best interest of someone who’s unable to advocate for themselves. In a probable cause arrest warrant and police documents, a Los Angeles police detective said that he, along with another detective and a Los Angeles County Adult Protective Services social worker, went to perform a welfare check on Mr. Lee on May 30. When they arrived at his home, they told security personnel to refuse entry to anyone who came calling on Mr. Lee during the interview, the documents said. Soon after that, Mr. Morgan arrived and was refused entry, after being told by a security guard that detectives and the social worker were inside. Mr. Morgan then called 911 and reported that three “unidentified” people had gone into Mr. Lee’s home and “locked everyone out,” according to a transcript of the 911 call. “I have taken great care of Stan Lee for the past many years, and have never had a problem directly with Stan. I have a fantastic relationship with him for the past many years as he has stated countless times on the record and I literally saved his life once.